Through various temporary periods, the City of Milan, has seen diverse transformation throughout its territory and has experienced periods of particular splendour and historical importance. It took on the role of the Capital of the Roman Occidental Empire from the 4th to the 5th Century, and it was in this very period, that it was established as a new centre propelling Christianity; this was also thanks to work of S. Ambrogio, who is not by chance, recognized as the Patron Saint of the City. The second important period, in which amongst other things, you can see the remarkable architectural remains, coincides with the Communal Period and the fight for freedom against the German Emperors, this phase goes from the 11th to the 13th Century and is testified by the Basilica of S. Ambrogio and that of S. Eustorgio as well as the Regional Palace. 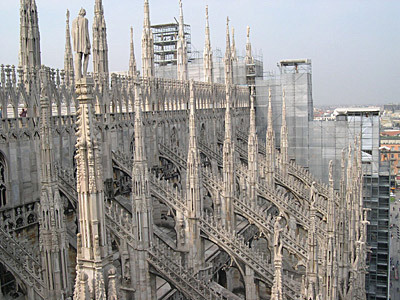 The Renaissance in Milan went from the 14th – 16th Century, and coincides with the governing by the Visconti’s, the Sforza’s and Ludovico the Moor; it is represented by the Cathedral, the Maggiore Hospital, the Castle Sforzesco, S. Maria delle Grazie and S. Maria presso S. Satiro, not to mention the presence in the City of great artists like Bramante and Leonardo. The transformation of the layout of the historical centre during the 18th Century is important, as it began the Napoleonic period and continued until the Unity of Italy. Milan also experienced an important contemporary period which began in the ‘50’s and continued to at least the end of the ‘80’s, placing the City in Italian vertices for cultural liveliness, activity and economic development. The urban layout of Milan is curious: it is set out in an aureole, with the centre being the Piazza del Duomo (Cathedral Square), with a first town wall being that of the Naviglio (mostly buried) and a second ring which corresponds with the 16th Century expansion. In the interior of this area is where the social, economic and cultural life of the City takes place. Piazza del Duomo is a casket of important testimonies: todays look dates back to 1865; the Square is dominated by the Cathedral, which was begun in 1386 and whose works concluded symbolically in 1765/69, with the spire which supports the famous “Madonnina” – in effect, the façade was completed with Neo-Gothic and Neo-Renaissance elements in 1887. The building is a masterpiece of Gothic style, characterized internationally by spires and arches, rampant and animated for a grand total of 2245 statues. The interior is sumptuous and obscure: light enters only through some of the large, coloured windows, in typical Gothic style and divided into five naves, reaching a height of around 70 metres. A visit to the Cathedral, cannot exclude a walk up to the so called “Terrazzi”, from which, not only can you admire a unique panorama of the City, but above all, also appreciate the complex architectural genius of the internal structure. In the square, you can also see the Royal Palace, built in 1778 and which often hosts art exhibitions of high standards. From the Square, you can see the beginnings of some important branching off: the axis of via Orefici/via Dante, which leads to the Sforzesco Castle, erected in 1450; one of the best examples of Renaissance Milan, being characterized by the central tower, a four sided structure, containing an internal structure of courtyards and towers. It hosts the Civil Art Collections and an Art Gallery with masterpieces such as the Pietà Rondanini by Michelangelo, the The Axis Room with frescoes by Leonardo, and Medieval and Renaissance sculptures. Behind the castle, a huge park extends outwards, which houses the Napoleonic Arch of Peace, from 1807. Milan hotels guide to choose your hotel, B&B and apartment in Venice by location, fee or category: secure bookings.